Whichever term you use to refer to it – the factory of the future, IIoT or Industry 4.0 – it is becoming increasingly apparent that manufacturing is getting smarter. Those companies who are ahead of the game when it comes to digital will likely experience its benefits much more quickly. And whole industries could be set to benefit, according to digital transformation consultancy firm, Capgemini’s latest report, Automotive Smart Factories: putting auto manufacturers in the digital industrial revolution driving seat. Based on a survey of more than 320 automotive manufacturers, the report reveals that smart factories could add up to a global $160 billion annually to the auto industry alone in productivity gains by 2023 onwards. According to the research, the automotive sector is among the most enthusiastic with regards to smart factories, making significant investments and setting high targets for its digital manufacturing operations. Those surveyed said that they expect, by the end of 2022, that 24 per cent of their plants will be smart factories, and that 49 per cent of auto manufacturers have already invested more than $250 million in smart factories. Looking at a wider market snapshot, the precursor to this report, Smart Factories: how can manufacturers realise the potential of digital industrial revolution, revealed that such facilities could add $500 billion to $1.5 trillion in value to the global economy in just five years. This report polled more than 1,000 manufacturing executives in companies with reported revenues of $1 billion or greater, operating across various sectors, from industrial manufacturing to life sciences and consumer goods. Manufacturers polled said that they predict that overall efficiency will grow annually over the next five years at seven times the growth rate since 1990. Some 76 per cent of respondents said that they either have a smart factory initiative that is ongoing or that is being worked on, and 56 per cent have aligned $100 million or more to smart factories. However, 14 per cent of respondents said they are satisfied with their level of smart factory success and 6 per cent are what the report refers to as ‘digital masters’ – meaning that they are at an advanced stage in the digitisation of production process. 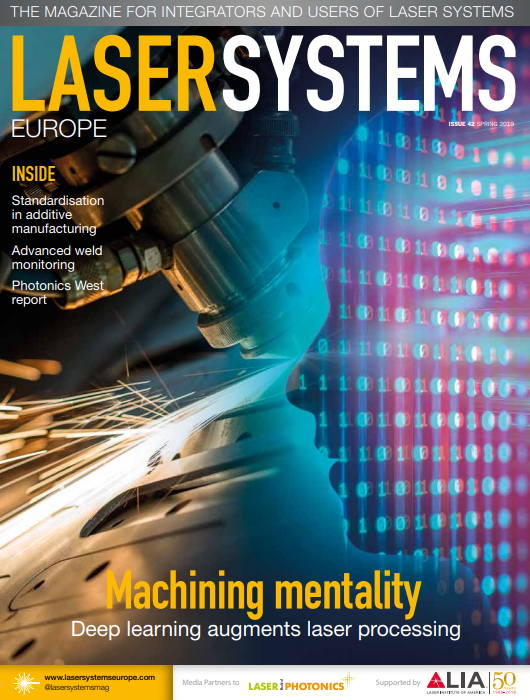 The laser systems industry is undeniably embracing the shift to Industry 4.0, and one business which can count itself among the so-called ‘digital masters’ is laser technology manufacturer Trumpf. 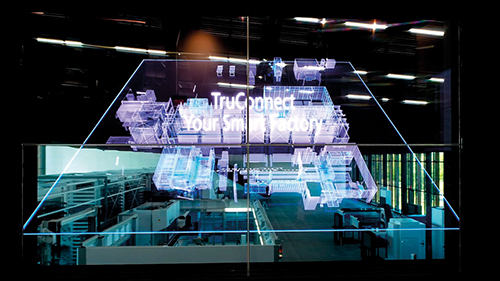 It recently opened its first smart factory for Industry 4.0 solutions in Chicago, designed with digitally connected production processes throughout. The company offers production solutions to customers via a range of components to help implement Industry 4.0 – something that Klaus Loeffler, managing director of sales and services, believes is here to stay. With the Chicago facility, which was designed by Berlin-based architecture firm Barkow Leibinger, Trumpf is effectively leading by example. An overall investment of €26 million went towards the 50,000sq ft facility – with half going towards the initial construction, and half on the equipment. The key target group for the factory is SMEs that are still at the start of their digital networking journey, and so this particular facility focuses on consulting and training customers as they introduce digitally connected production solutions. The intelligently connected sheet metal process chain was designed in from the start, with custom-designed architecture including the control room with large screens detailing real-time process performance data for the current production process. The 55-metre production hall includes a connected sheet metal manufacturing line, with a high storage bay that supplies materials to the machine tools connected to it. The control room, with its large display areas – provides visitors with key process indicators from the ongoing production in real time. The benefits of adopting smart technology are gradually becoming more widely acknowledged, and not only are we seeing production processes become optimised, we are also seeing a number of opportunities created. Notably, Optech Consulting recently revealed its view that the market for laser systems for additive manufacturing has seen an increase of more than 25 per cent in the past five years, with additive manufacturing of metal parts, in particular, playing a key role in market growth, as manufacturers begin to use 3D printers as a way to optimise the component build process. Of the two main areas concerning additive manufacturing processes, laser deposition welding with wire or metal is more established, while an entire component production model using laser construction technology is still in its relative infancy, and it is this that Optech Consulting cites as the driver for the strong growth demonstrated. This process is becoming established in a number of manufacturing sectors as a method for making plastic components, and now metal 3D printing looks set to reach similar heights. This is the belief held by the Fraunhofer Institute for High-Speed Dynamics, Ernst-Mach-Institut (EMI), which recently opened its own 3D printing laboratory for metals and structural materials, where researchers discovered that even minimal reductions in the material and resources used per component can generate high cost savings for manufacturers. The lab is home to what the instutute calls ‘one of the largest commercially available 3D printers for metal currently in existence’. Using laser powder-bed fusion – where metal powder is applied to the construction platform and melted in defined areas by laser radiation, the powder solidifies and a new layer is applied – defined layer strength structural material is created just where it is required. This type of process allows for more creativity when it comes to new and bespoke designs, as it removes the restrictions associated with conventional manufacturing. It also means that operations can be reduced significantly thanks to the integration of multiple components into a single component. As additive manufacturing generates material just where it is needed, manufacturers are afforded the additional benefit of potential savings on resource. At the new Fraunhofer EMI lab, metal structures can be created with dimensions of up to 40cm, offering a new way of designing weight-optimised components, in even complex shapes. As part of the research, a wheel carrier was used to explore the economic viability of the manufacturing process in comparison to conventional techniques. The researchers simulated and analysed a draft design using the finite element method (FEM) to determine the correct geometric shape with structural optimisation methods, and constructed the wheel bearing in a lightweight design which fitted the defined load scenarios and offered maximum performance. Because of their geometric complexity, said Klaus Hoschke, scientist and group leader at Fraunhofer EMI, ‘structures produced in this way cannot be manufactured by conventional methods, such as milling or turning’. Using this version of the wheel bearing, 10kWh of electricity was needed for the additive process, as opposed to 12kWh for the conventional design. The manufacturing time was cut by 14 per cent and CO₂ emissions by 19 per cent. The researchers additionally discovered that material consumption could be reduced by 28 per cent. As for the future of smart manufacturing, according to Industry 4.0, the current consensus appears to be veering toward acceptance that it is something to embrace for potential process improvements, cost savings and increased efficiency. It is something that Hoschke believes Fraunhofer EMI’s ‘results for resource efficiency in the manufacturing process should reinforce’. At the very least, the drive to smart manufacturing seems to bring with it some exciting opportunities.